Searching for the perfect job vacancy is a full-time job in itself. There are hundreds of thousands of online vacancies for every manner of profession, and to match the ideal candidate with his/her dream job is like finding a needle in a haystack. One of the greatest challenges is deciphering which online job adverts are relevant to which job seeker. For this reason, it is important that employers write great job ads that will attract the right applicants to your inbox. 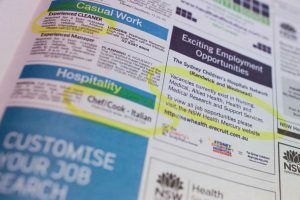 The first thing that any jobseeker sees is the job advert title, it is what they first click on if they’re interested. It is important that employers construct the perfect title containing all the relevant keywords and information on position, salary, and location. Nail the job title with specific and compelling details and the right candidates will come knocking. Once a job advert is clicked on, the interested job seeker can then see the full job description. Not only does this need to contain important information on job level, qualifications, and required experience, but also details on company culture and values. Do NOT let the HR department just regurgitate the same old ‘copy and pasted’ job description. It needs to be something that the relevant departments work on together. Write it as though you’re the person doing the job, a clear and simple job description with no hidden messages. Now that you’ve nailed the job advert title and job description, it is important to get the order right. Not only do search engines put more emphasis on keywords towards the top of the job description but job seekers also need to be hit with the important details as early as possible. The order needs to be neat and concise. Start with a quick rundown of the essential aspects of the job. Then map out the 4 or 5 principal role requirements which will provide the potential candidate with the tasty morsels needed to read further or not. After these two sections, write a fuller, more in-depth job description including all the extra details such as company culture, details about the department and company, certain perks and other attractive selling points. Salary information is a contentious issue. Many HRs do not provide salary information in the job advert, but research shows that better candidates apply when salary is available on the advert. The more information they are privy to the better. Nailing the job description providing all the right information saves you loads of time and resources in a recruitment search. Tagged under: company culture,	job advert,	job description,	job title,	online job advert,	salary.